Mackenzie Davidson Reid was the son of William (farmer) and Barbara Ann (nee Hamilton) Reid of Basswood, Manitoba. He had two younger brothers, Wilfred, 16, and Oliver, 14. They attended the United Church. Reid listed softball and hockey as sports he engaged in. He liked fretwork and was able to operate a tractor. He was a student, helping his father on the farm prior to enlisting in Winnipeg, Manitoba, December 1941. At No. 3 ITS, Victoriaville: "A good solid farmer lad who, if he can fly, will be a backbone to his crew. Excellent service spirit." Alternate: Air Bomber. At No. 13 EFTS: "A plodder, determined, works hard. Link: Average performance, turns weak, good in let-downs and airspeed control CFI: High average ability, should make an above average service pilot." At No. 2 SFTS: "Above average flying ability. A willing and hard worker. Conscientious and quite industrious. Does not impress with much ability towards leadership. General deportment above average." Reid was awarded his Pilot's Flying Badge on May 19, 1943. He was sent from No. 1 OTU to No. 1 Y Depot on June 19, 1943. He left Halifax on June 23, 1943 and arrived in the UK on July 1, 1943. He went to 3 PRC on July 2, 1943, then to No. 55 OTU on July 26, 1943. 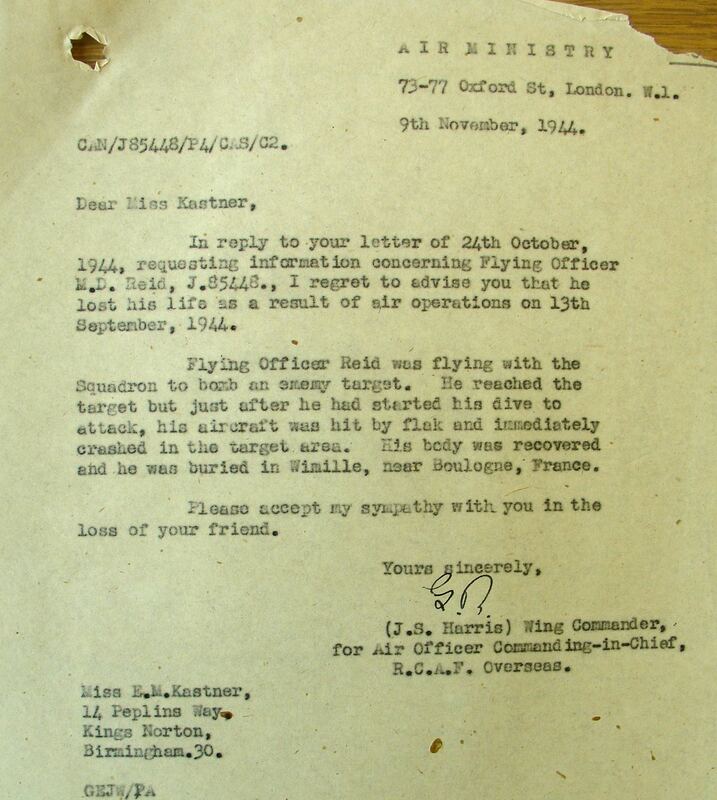 He was posted to 197 Squadron on September 17, 1943. In the Telegram En Clair, it was noted that at 1445 on September 13, 1944, Typhoon 1B 198 flown by F/O Reid burst into flames and dived into the ground. 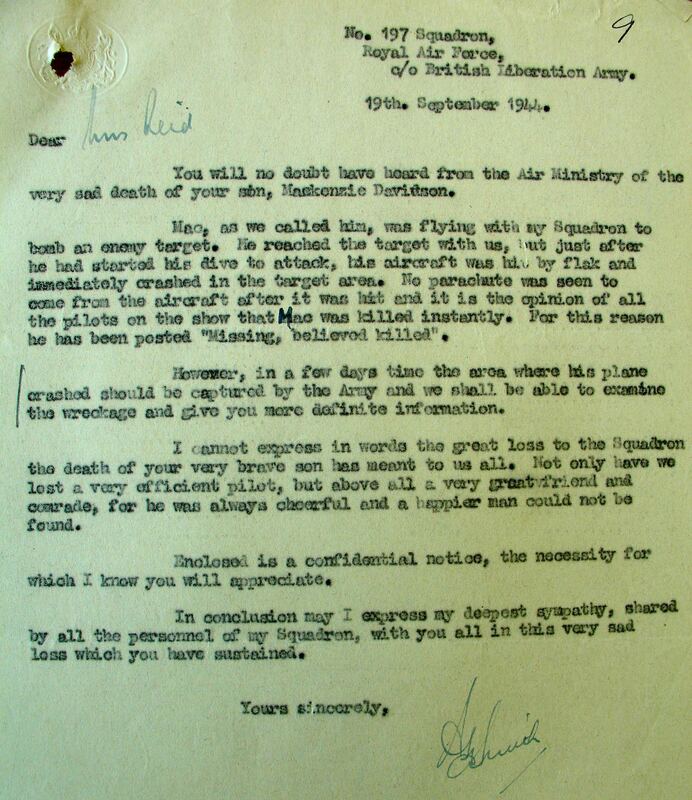 In September 1944, Mrs. Reid received a letter explaining the circumstances of her son's death. "Mac, as we called him, was flying with my Squadron to bomb an enemy target. He reached the target with us, but just after he had started his dive to attack, his aircraft was hit by flak and immediately crashed in the target area. No parachute was seen to come from the aircraft after it was hit, and it is the opinion of all the pilots on the show that Mac was killed instantly." 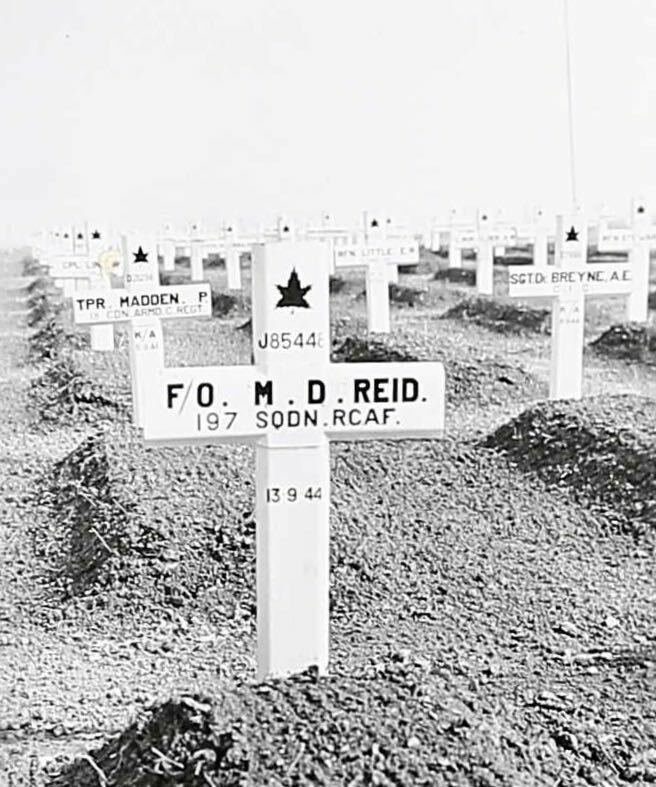 Reid's body was recovered and buried in Wimille, near Boulogne, France.